Italy was the inspiration for this week’s featured wedding, and we have to say it was one of the most inspirational and creative weddings we have helped to plan this year. 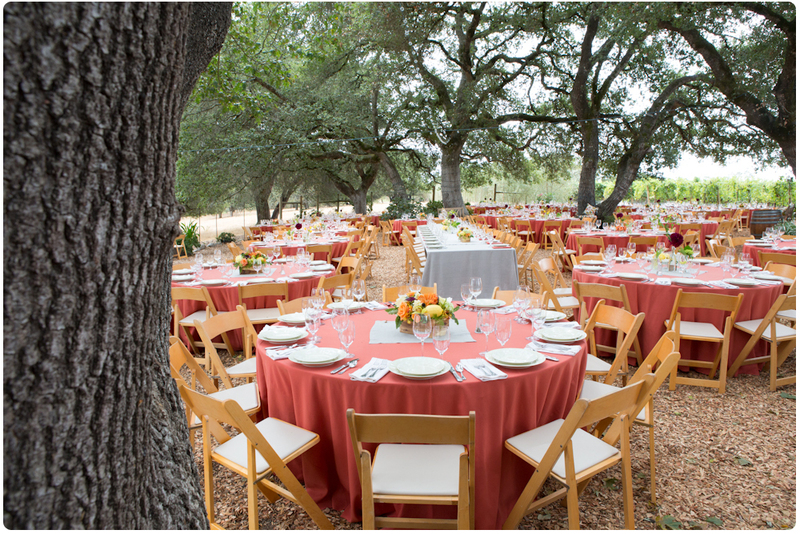 The location: The Calegari Vineyards in Healdsburg. This exclusive vineyard only holds about eight weddings a year, and luckily for us, we have assisted with almost all of them! 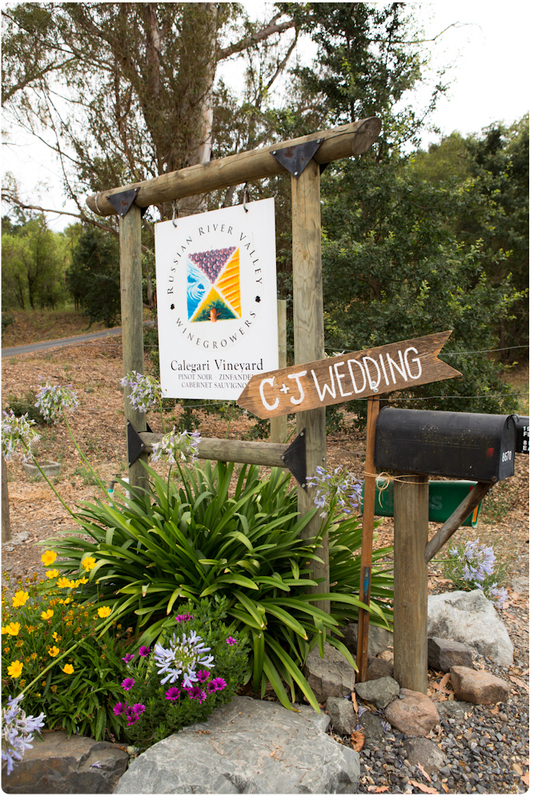 During the coming months we will be posting more photos from this fantastic location, but for now, let’s take a walk through the vineyards at Candace and Joe’s magical day. Just follow the arrow! Candace and Joe decided on burnt orange and grey for their wedding colors. 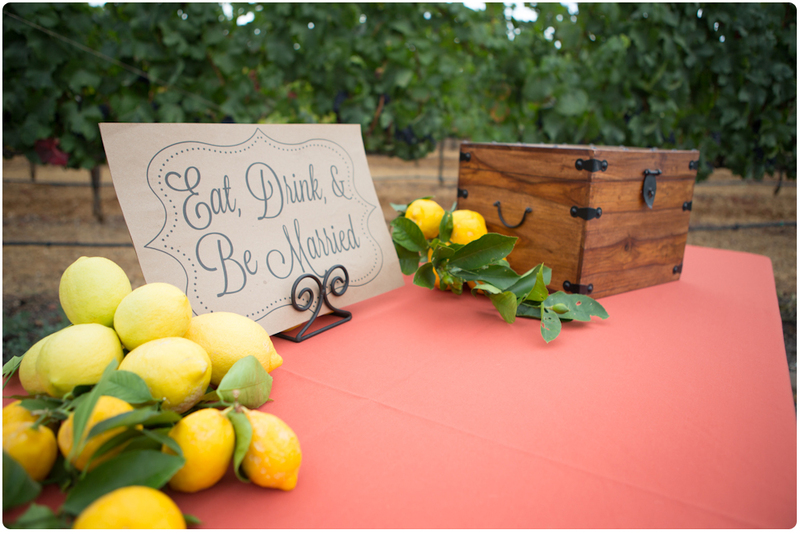 The combination worked great with the rustic vineyard location. 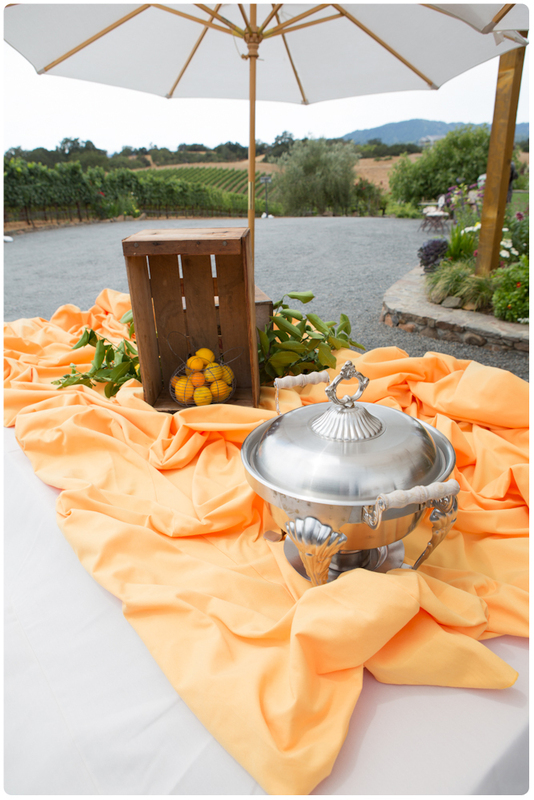 Grey linens were used for the head table that ran in the middle of the reception area. 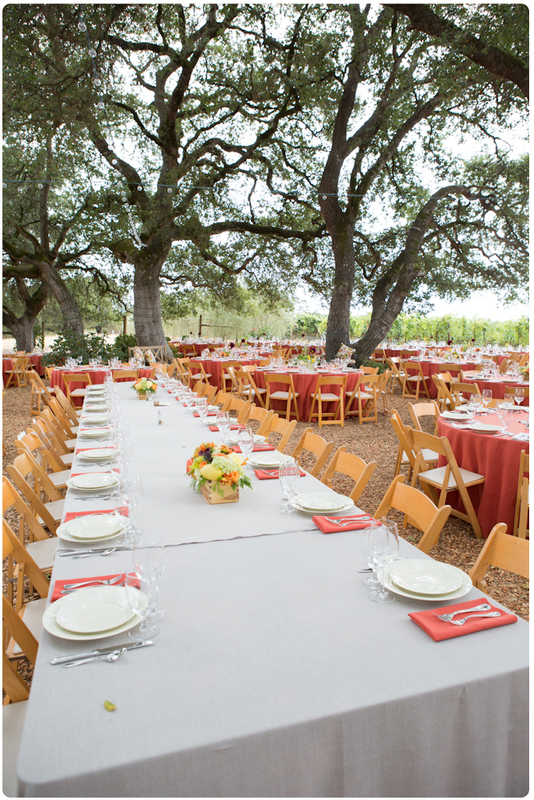 The guest tables were covered in burnt orange linens and accompanied by hem stich white napkins and natural wood chairs. 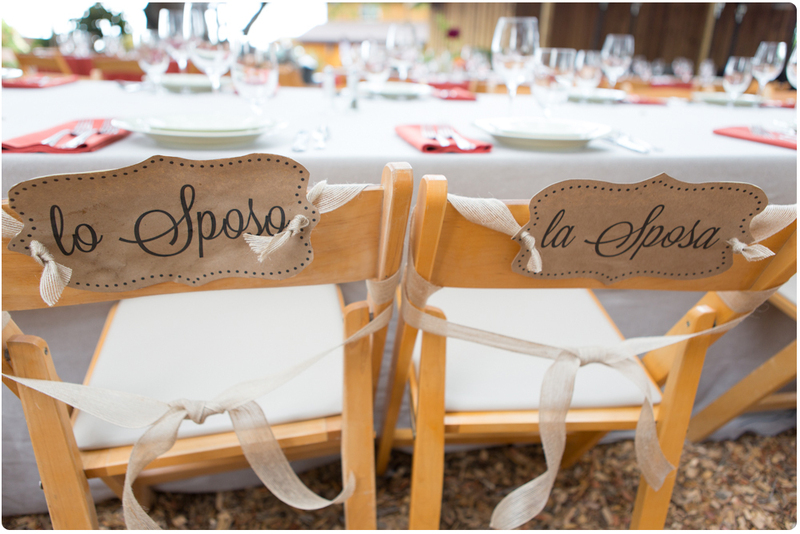 Handcrafted signs written in Italian were tied to the chairs of the bride and groom. Adorable. 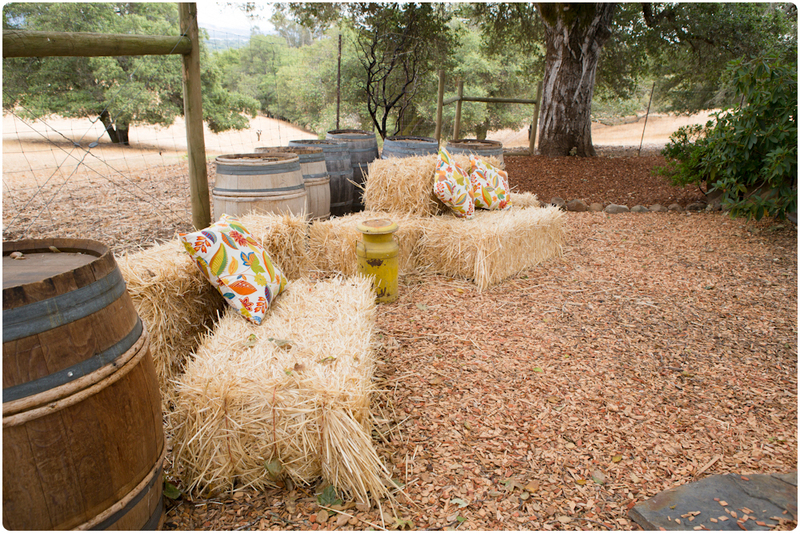 Keeping with the Italian vineyard theme, hay bales and wine barrels were used for the lounge area and accented with throw pillows that matched the theme’s colors. Very cute! 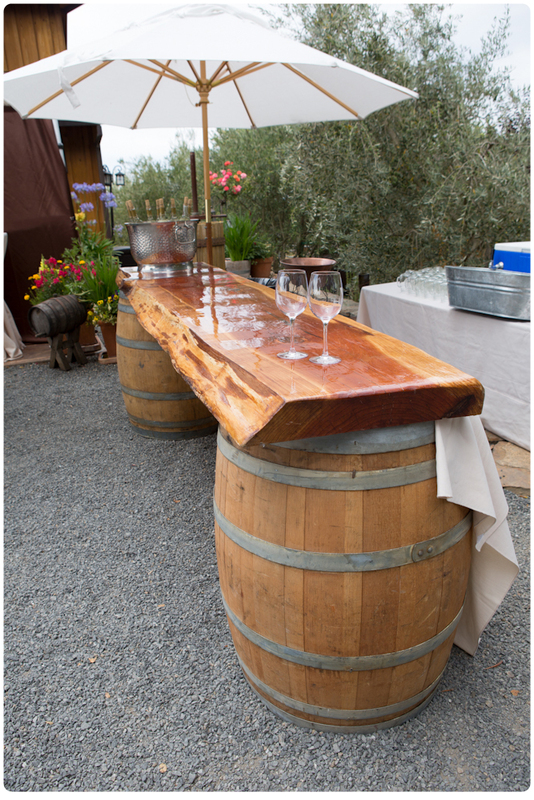 The happy couple chose to use our wine barrel bar with a market umbrella to serve drinks to their guests. It tied in perfectly with this Tuscan winery theme. Food was catered by Maestretti Catering. Jimmy has been catering for many years and most of the long-standing farm families in the area use Jimmy for their events and weddings. Jimmy is old school and doesn’t have a website, but if you want to hire Maestretti Catering for your next event, you can find his contact details on the Petaluma Chamber of Commerce website. 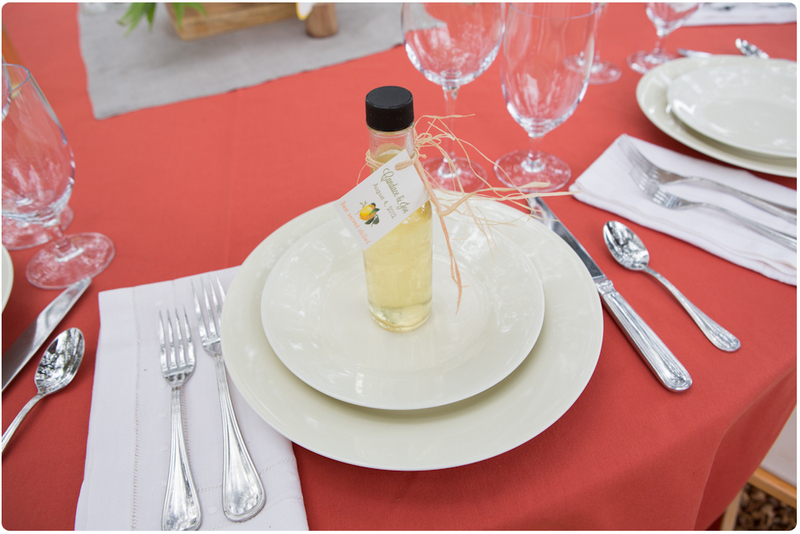 For the guest favors, the couple gave small olive oil bottles tied with string. Olive oil is synonymous with the Italian way of life, so this favor went perfectly with the theme. This wedding was overflowing with amazingly creative DIY ideas. For more pictures from the wedding, head over to our Pintrest page and also keep an eye on our Facebook! Congratulations to Candace and Joe, it really was a magical day!